As the global energy needs are rising, the Arctic is emerging as a promising region for energy development. The region may contain almost one-quarter of the world’s undiscovered reserves of oil and gas. In addition, the Arctic carries large mineral reserves, both on and off shore. Access to energy is critical for Arctic inhabitants. Energy resources can present positive opportunities for business development provided this is done with due regard to traditional and indigenous lifestyles and sustainability. This was the backdrop to the AEC and Arctic Frontiers joint side event during the 2018 ONS fair. Starting with an outlook on the global energy demand, Senior Analyst Toril Bosoni of the International Energy Agency (IEA) stated that the need for fossil fuels is not about to vanish. With the ageing fields losing production capacity, there is a need to annually replace the production volume equivalent to 1 North Sea. Addressing disruption and disruptive technologies, Ms. Bosoni also discussed the role of electric vehicles. While their demand has grown substantially, electric vehicles still account for only 1 % of the global vehicle sales. The following panel discussions featured expertise from both fossil energy development, renewables as well as carbon capture and storage (CCS). 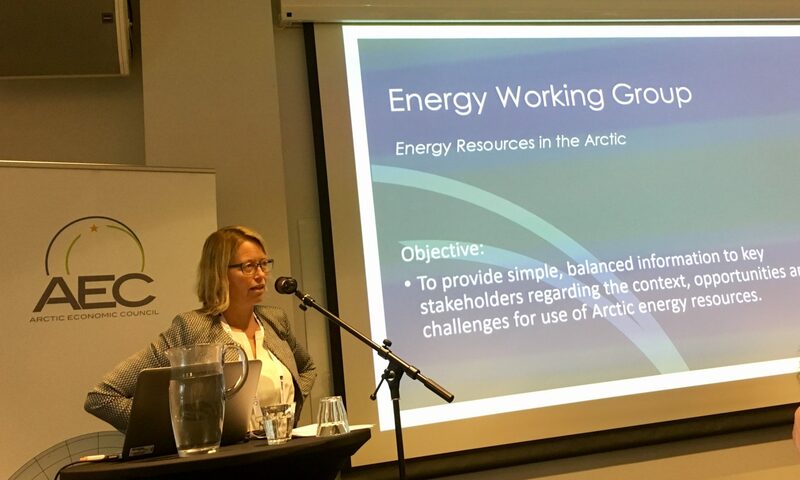 Experiences from both fossil and renewable energy sector highlight dialogue with local stakeholders as a key element for successful operations in the Arctic. Energy company St1 Norge AS’ Director of Renewable Energy, Mr. Thomas Hansen, underlined how dialogue with indigenous and local peoples has significantly changed the plans for the Davvi wind farm in Northern Norway. Both St1 Norge AS and Eni Norge AS stated lack of infrastructure and existing value chains as one of the major challenges when operating in the Arctic. Despite the challenges, the Arctic holds a significant renewable energy development potential. As Mr. Hansen stated, there is no place cheaper than the Arctic for wind energy production. The work on decarbonizing is both ongoing and needed, as was presented by CCS Director Jannicke Gerner Bjerkås of Fortum Oslo Varme. Ms. Bjerkås spoke about CCS as a part of the solution to the global decarbonizing need. The world is currently transitioning from land mills to waste generation. The natural next step is carbon capture from waste incineration. Representing the operator of the world’s northernmost oil field in operation, Communications Manager Andreas Wulff of Eni Norge AS reflected on the company’s experiences operating the Goliat oil field. Facilitating education and knowledge enhancement locally has led to the creation of jobs and improved emergency preparedness. 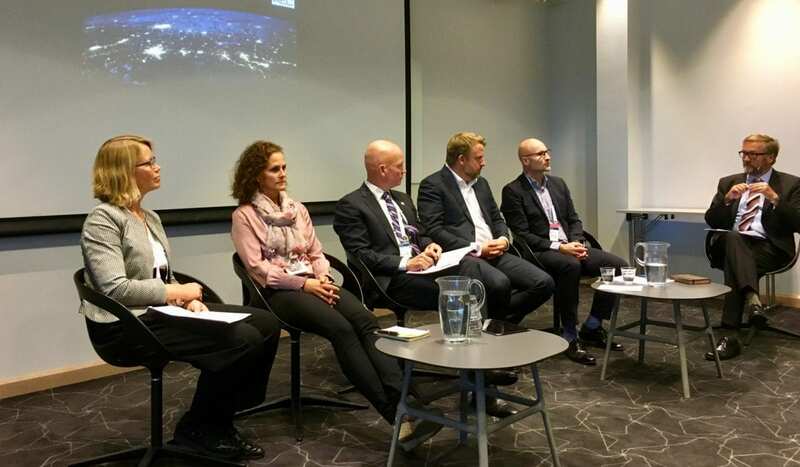 The manager of Equinor’s Arctic Unit, Ms. Toril Inga Røe Utvik, reminded that Arctic projects need to compete with other projects in the company to be realized. Both Eni and Equinor have built their presence in the Arctic gradually, benefitting from their earlier experiences. Equinor’s experiences show that strong collaboration with other companies is essential to make Arctic projects profitable. This cooperation needs to continue also during the operational phase. The Chairman of the Arctic Economic Council, Mr. Tero Vauraste, addressed the need for energy both in the Arctic and in global context. Locally in the Arctic, the use of hybrid solutions is often the recommended solution. Mr. Vauraste further discussed the opportunities for sustainable energy development in the Arctic. Highlighting the need to use best available technology, he reminded the audience that the biggest risk in energy development and consumption comes from the protective measures hindering the free transfer of technology and knowledge. The intuitive image of projects in the Arctic is often related to high cost level and difficult operating conditions. According to the operators, this is not the whole truth. The panellists highlighted the need to understand the regional variations in the Arctic. Each project in the Arctic is unique.